I call this dish “Vicki’s Noodles” because I got the recipe from an old friend named, Vicki, a nurse and confessed Jersey Girl I knew many years ago. Vicki spent some time in Southeast Asia after nursing school, when there was an unpleasant thing going on between the locals and the U.S. Army. She could cook, and was especially adept at Asian cuisine. I have several of her recipes in my notebook. 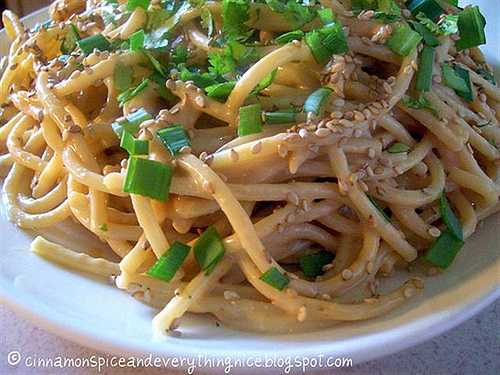 This one is Cold Sesame Noodles. The ingredients beyond the sauce are completely optional. I like to use fresh, crispy bean sprouts. A chef I once worked with suggested I add red cabbage and some shredded carrot for color and texture. I liked the way that worked out, and I have also variously included chopped snow peas or sugar-snap peas, which we grow in our garden. I also often give it a note of Thai by adding some chopped basil and a teaspoonful of fish sauce. If you like meat in your salad, add grilled slices of chicken or London broil, or try it with cubes of premium dry tofu, drained and dried or lightly grilled. Play with this one and see what you like. There’s almost no ingredient you could add that would not make it better. The sauce is a nice sweet and tangy one, but it doesn’t get in the way of any kind of additional ingredient. My peanut butter of choice is Crazy Richard’s peanut butter, because the only ingredient in the jar is peanuts. No added oil, salt, sugar, or any stabilizers. Just peanuts. It’s the best peanut butter to control the mixture of flavors, which is significant. I make the dish with whole wheat linguine, but it is just as good with Asian buckwheat noodles, rice noodles, plain spaghetti, or whatever pasta you prefer. Adjust the amount of red chile oil to your own liking. This one is not too spicy. To kick it up, increase the hot chile oil to 1 tablespoon instead of a teaspoon. 1 bunch fresh scallions, chopped, roots discarded. In a small bowl, combine the next six ingredients (peanut butter through chile oil) with a whisk until smooth and completely blended. Add half the peanuts; the carrot, cabbage, and bean sprouts; and all but a handful of the scallions, Chop the Set aside at room temperature. Posted on August 5, 2012, in Uncategorized. Bookmark the permalink. 1 Comment.